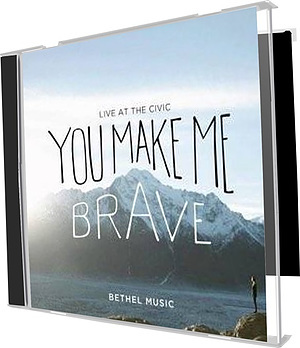 ‘You Make Me Brave’ is the up-and-coming 2014 live album from the charismatic Californian worship band – Bethel Music. Chorus: As Your love, in wave after wave // Crashes over me, crashes over me // For You are for us // You are not against us // Champion of Heaven // You made a way for all to enter in. Join the following who gathered to worship God with Jenn Johnson, Kari Jobe, Amanda Cook, Kristene DiMarco. Experience the shouts of praise and the swells of the spontaneous that make every Bethel Music release something spectacular. You Make Me Brave Live CD/DVD by Bethel Music was published by Integrity in April 2014 and is our 1127th best seller. The ISBN for You Make Me Brave Live CD/DVD is 700615372645. Brilliant album from the very talented women of Bethel church. I particularly liked , It is well, Shepherd and Wonder. A real worship album that spoke to my heart. Would definitely recommend. Got a question? No problem! Just click here to ask us about You Make Me Brave Live CD/DVD. You Make Me Brave is a highly anticipated release from Bethel Music this year. Recorded live at Bethel Women's Conference, the album debuts original songs as well as several beloved anthems revamped. Featuring worship leaders Jenn Johnson, Kari Jobe, Amanda Cook, Kristene DiMarco and more, the strength of this album lies not only in its songs but in spontaneous moments of worship that were captured. The accompanying DVD provides vibrant and powerful visuals that inspire the worship experience. For corporate or personal worship, You Make Me Brave sings a message of the courage, faith and victory we find in Jesus. Now Playing: You Make Me Brave Your browser does not support the audio element.